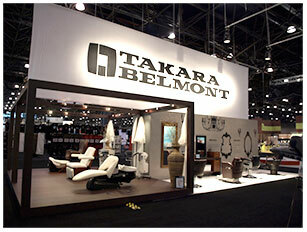 The Takara Belmont Corporation is the leading manufacturer of barber chairs, salon and dental equipment in the world. The company is based in Japan with branches in many parts of the world, including Brazil, the United States and Canada, France, Germany, Italy, United Kingdom, Korea, Taiwan, Singapore and China. It also owns the Koken Manufacturing Co., Inc. based in St. Louis, Missouri, USA. Koken was a popular barber supply brand in the US during the early 1900’s. Takara has distributors in 80 countries, with 9 large showrooms in the US and Canada. It also has a lot of seating and styling station designs. In fact, the company has more of them than all other manufacturers combined. Over the years, it has become the design trend setter, paving the way for elegant and top quality salon and barber equipment. The salons it endorses are award winning. Furthermore, it houses the largest team of professional designers. Takara Chuzo Ltd. was founded by Hidenobu Yoshikawa in Japan in 1921. It wasn’t until 1931 that Takara started producing barber chairs. In 1950, it developed it’s own version of the hydraulic adjustable barber chair. Six years later, the company was finally ready to enter the market in the United States. It established the Takara Company N.Y. Inc. in New York City as an overseas subsidiary company. This subsidiary would later become Takara Belmont USA, Inc. In 1959, Belmont Chairs London Ltd. was established – its second overseas branch. The 1950’s and 60’s were really interesting times in the United States’ barber industry. Takara had a tremendous impact when it entered the market. It released its highly styled, low-priced product line named Belmont. Back then, the two leading manufacturers, Koken Barber’s Supply Company and Emil J. Paidar Company were not prepared to face the new challenger in town. In addition, a new trend was emerging. The Beatles hairstyle was in and clean cut was out. Haircuts were virtually replaced by hairstyles, and these made barbers lose younger customers. Salons began sprouting while the number of barber shops declined. The company that was able to adapt well was no other than the Takara Belmont Company. Things had gone better for the company when it released the world’s first electric barber chair in 1962. It reduced stress on the hands and was a big hit among barber shop and salon owners. In the following years, the company expanded its operations to other countries and ventured into hair care products. In 1966, it partnered with Wella, a German company specializing in cosmetic supplies. Then in 1969, it acquired Koken. With the Koken and Belmont brands under one roof, Takara effectively became the largest manufacturer of barber chairs in the United States. Its long and rich history in making barber chairs made it a fierce competitor in the barber industry. VINTAGE BELMONT BARBER STYLIST CHAIR EXCELLENT CONDITION!